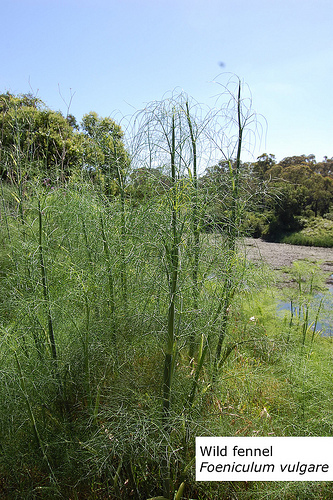 Notes: As Old English finule, fennel is one of the nine plants invoked in the pagan Anglo-Saxon Nine Herbs Charm, recorded in the 10th century. The Greek name for fennel is marathon (μάραθον) or marathos (μάραθος), and the place of the famous battle of Marathon and the subsequent sports event Marathon (Μαραθών), literally means a plain with fennels. Edible Uses: Leaves – raw or cooked. A delicious aniseed flavour, the young leaves are best since older ones soon become tough. They are often used as a garnish on raw or cooked dishes and make a very pleasant addition to salads. They help to improve digestion and so are particularly useful with oily foods. 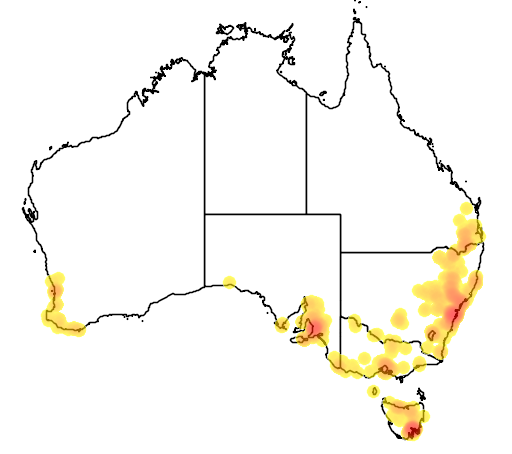 The leaves are difficult to store dried, though this does not really matter since they can often be harvested all year round, especially if the plants are in a warm, sheltered position. Leaf stalks and flower heads – raw or cooked. A similar aniseed flavour to the leaves. The aromatic seeds are used as a flavouring in cakes, bread, stuffings etc. They have a similar flavour to the leaves and also improve the digestion. The sprouted seeds can be added to salads. An essential oil from the fully ripened and dried seed is used as a food flavouring in similar ways to the whole seed. Root – cooked, somewhat parsnip-like. The leaves or the seeds can be used to make a pleasant-tasting herbal tea. Warnings: Skin contact with the sap or essential oil is said to cause photo-sensitivity and/or dermatitis in some people. Ingestion of the oil can cause vomiting, seizures and pulmonary oedema. Avoid for small children. Avoid if cirrhosis/liver disorders. Diabetics check sugar content of preparation. Medicinal Information: Fennel has a long history of herbal use and is a commonly used household remedy, being useful in the treatment of a variety of complaints, especially those of the digestive system. The seeds, leaves and roots can be used, but the seeds are most active medicinally and are the part normally used. An essential oil is often extracted from the fully ripened and dried seed for medicinal use, though it should not be given to pregnant women. The plant is analgesic, anti-inflammatory, antispasmodic, aromatic, carminative, diuretic, emmenagogue, expectorant, galactogogue, hallucinogenic, laxative, stimulant and stomachic. An infusion is used in the treatment of indigestion, abdominal distension, stomach pains etc. It helps in the treatment of kidney stones and, when combined with a urinary disinfectant like Arctostaphylos uva-ursi, makes an effective treatment for cystitis. It can also be used as a gargle for sore throats and as an eyewash for sore eyes and conjunctivitis. Fennel is often added to purgatives in order to allay their tendency to cause gripe, and also to improve the flavour. An infusion of the seeds is a safe and effective cure for wind in babies. An infusion of the root is used to treat urinary disorders. An essential oil obtained from the seed is used in aromatherapy. Its keyword is ‘Normalising’. The essential oil is bactericidal, carminative and stimulant. Some caution is advised, see notes above on toxicity. 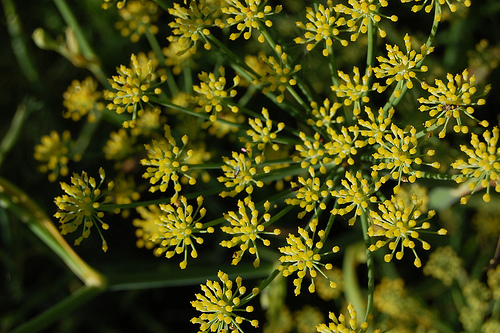 The German Commission E Monographs, a therapeutic guide to herbal medicine, approve Foeniculum vulgare for cough, bronchitis, dyspeptic complaints. The seed yields up to 5% of an essential oil which is used medicinally, as a food flavouring, in toothpastes, soaps, perfumery, air fresheners etc. The flavour of fennel oil depends upon its two main constituents. ‘Fenchone’ is a bitter tasting element whilst ‘anethole’ has a sweet anise-like flavour. The proportions of these two ingredients varies according to strain and region. The quality of the oil also depends upon how well the seed has been dried – the oil from fully ripened and dried seeds being much sweeter and more fragrant. The dried plant is an insect repellent, the crushed leaves are effective for keeping dogs free of fleas. The plant was formerly used as a strewing herb. Yellow and brown dyes are obtained from the flowers and leaves combined.